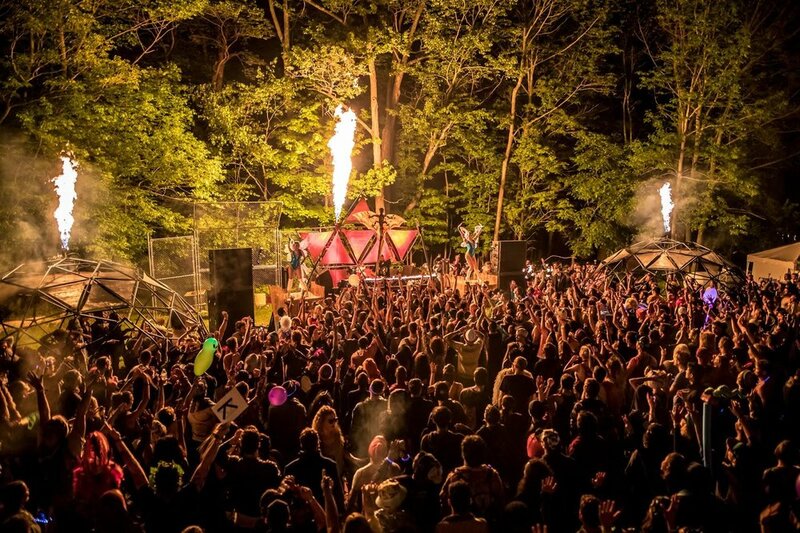 Elements Lakewood Music & Arts Festival will be returning to its bucolic Pennsylvania lakeside camping retreat for the third edition, and has announced the lineup for this Memorial Day weekend, May 24-27, 2019. Produced by independent New York City party starters, BangOn!NYC, Elements Lakewood welcomes Disclosure, Big Gigantic, Damian Lazarus, FISHER, Francesca Lombardo, Justin Martin, Seth Troxler, Shiba San, Sofi Tukker, and over 100 more artists across the 200 acre grounds boasting a beach, lakeside views, a verdant forest, lush green fields and large indoor recreational spaces. Offering a variety of accommodation options from camping and cabins, festival-goers can partake in wellness and summer camp activities, lake swimming, incredible music, live interactive art, theater performances, and so much more. Three days and nights of nearly non-stop music, Elements Lakewood 2019 will feature acts across house, world beats, techno, bass, jam rock and funk on seven uniquely-themed stages running from sunset to sunrise. The stages are divided up and perfectly placed which each act appropriately to its style of sound, Fire Stage, Earth Stage, Air Stage, Theatre Stage, Water Stage, Alchemy Stage, Pool. Additionally, more than 30 acts will play over the weekend including, rising indie-electronic composer CloZee, Canadian future funk house duo The Funk Hunters, and Robot Heart regular Atish. Offering attendees a break from the dance floor, Elements Lakewood's Wellness and camp games programming will provide a variety of games, workshops and wellness activities. Welcoming industry leaders in healing and wellness, attendees will be able to participate in aromatherapy, bass, hip-hop and sunset yoga, a cuddle and consent class, ecstatic dance, improv comedy workshops, sound baths, and plenty more to be announced. Making use of its locale, Elements will allow festival-goers to relive their childhood summer camp memories with basketball and volleyball matches, a ropes course, a zip line, rock climbing, a live prom band, roller skating disco with live DJs, campfire sing-alongs, kayak trips at sunset, and other water sports including canoeing, swimming, and more to be announced. Announcing the return of the Unicorn Lounge, fans looking to pamper themselves can book in with the barber, indulge in a manicure, or get party-ready with some face paint and glitter. This year, Elements is pleased to present work from a variety of exceptionally talented artists. Welcoming the return of the Pirate Ship to the Water Stage, day party fans can float around on giant rafts or get in the groove under the sun on the shore. After dusk, fans can look forward to spontaneous nighttime adventures deep into the forest to marvel at hanging kaleidoscope lights, natural tree sculptures, climb-on installations, dance to their favorite DJs under the forest canopy and hang out in hidden tree houses. An additional late night forest stage nestled among 80 foot pine trees covered in woodland décor. Keeping attendees refueled throughout the festival weekend, a wide selection of food and beverage vendors will also be on-site catering to all palates, with a number offering 24 hour service. Early Bird 3-Day and VIP passes for Elements Lakewood 2019 are available now while supplies last. Festival-goers can choose from a variety of accommodation options including camping, Glamping Village packages for up to 4 people, as well as private cabins, apartments, and bungalows for up to 20 people. Elements Lakewood is only a few hours away from Boston, New York City, Philadelphia, D.C., attendees can travel with transportation partner Bus.com. Make Memorial Day Weekend the best ever with nothing but non-stop fun, music, arts, and an unforgettable memory that will last a lifetime.